Big week for data and Fed policy this week. We’ve seen some slowing in growth lately, but last week’s advance U.S. Gross Domestic Product report was encouraging. Readers of the Monday Morning Minute know that incoming data raised some red flags in the first quarter. Our Fundamental Conditions Barometer peaked with the passage of the tax act in December, declined through the remainder of the winter, and stabilized in April. According to last week’s report from the Bureau of Economic Analysis, the U.S. economy grew by an estimated 2.3% in the first quarter. This result is lower than the 2.75% rate most economists expected back in February (Blue Chip survey), but was not bad given some weaker readings on consumption and manufacturing recently. In addition, there is reason to expect things to firm up from here as tax cuts flow through to the private sector. We will be closely watching this week’s consumer, manufacturing, and employment data to see if April’s readings point to a “spring bounce” or not. Meanwhile, a closer look at last week’s advance GDP report reveals important takeaways on the state of the economy. Optimism that came with improving global growth in 2016-2017, coupled with tax cuts, is showing up as more investment. Greater growth, optimism, and investment can all be helpful in extending the cycle and boosting profits. On a longer-term basis, investment is a major contribution to lifting potential growth. According to data on capital formation within the GDP report, we see that private capital formation, a proxy for investment, is estimated to be growing near 4.6% (chart, below). This is a significant improvement from 2016, when investment essentially ground to a halt. Sustaining this trend is important for the market as a whole because it encapsulates critical information about business expectations as a whole. Because risk-taking entrepreneurs and businesses of all stripes make plans based on expected demand for their products, it is important to take a look at trends in demand. Buried deep in the report is a helpful measure of this demand. 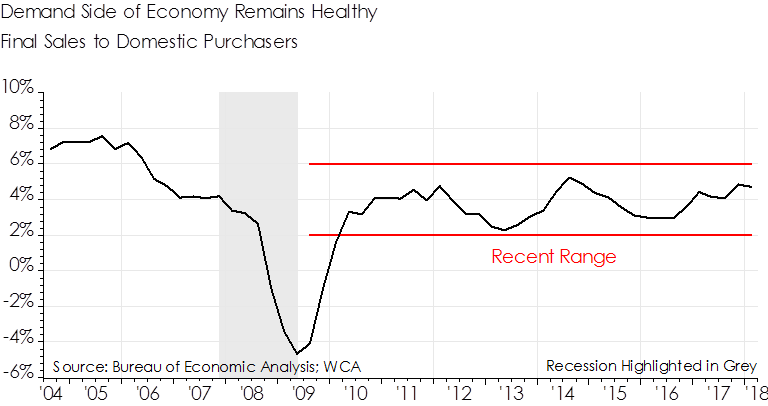 It is called “Final Sales of Domestic Product.” This is a cleaner measure of the demand side of the economy as it excludes inventories and looks at what people are actually spending. 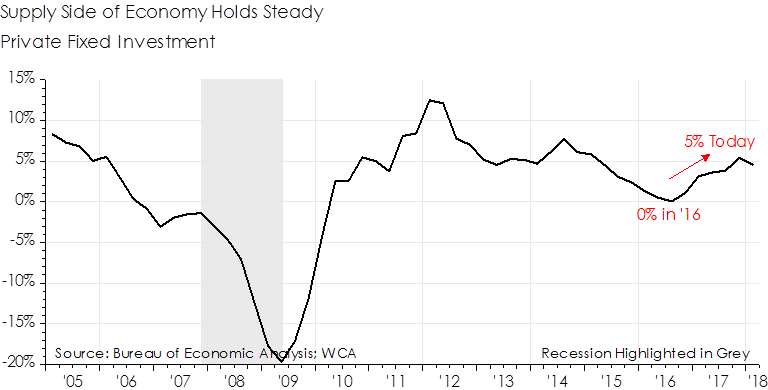 Whenever this measure is running below overall production (GDP), businesses might have reason to worry (chart, below). With signs of steady growth in the economy, coupled with above 50 readings on our WCA Fundamental Conditions Barometer, we expect further growth ahead. And as the Federal Reserve gets set to meet on rates this week, we expect the central bank to affirm their plans to continue rate increases against a background of firming inflation and full employment.